Amy-Joyce Hastings (Fools of Fortune), Seán T. O'Meallaigh (Kings) and IFTA winner Ger Ryan (Intermission) will star in new Irish feature 'The Callback Queen'. The feature, directed by Graham Cantwell (Trapped) is set to shoot in London and Galway from April 15th until May 21st. The film follows Amy Joyce Hasting’s Kate Loughlin, an ambitious but unlucky actress on the cusp of her big break. Her resolve to maintain her integrity in the cut-throat arena of show-business is put to the test as she gets closer and closer to her desires. Principal photography for the romantic comedy will take place primarily in London, with additional scenes shooting in May in Oughterard, Co. Galway for, what director Graham Cantwell describes as a “film within a film” sequence. The film is to be shot by Graham Cantwell, Anthony Bowes and Patricia Delgado in HDDSLR on the Canon 7D. 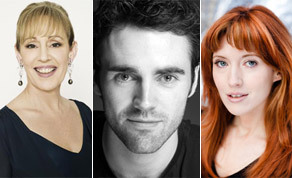 The feature's other cast members include Mark Killeen (Rise of the Footsoldier); Vicki Michelle MBE (Allo, 'Allo); Morgan Deare (Mission: Impossible); Kate Braithwaite (Little Deaths); Maximilian Befort (Henri 4); Sophie Berenice (Everywhere and Nowhere); Greg Kolpakchi (Harry Potter and the Goblet of Fire); Ben Wigzell (The Hot Potato) and Damar Martin (Gladiators). Kasia Katner is the film’s wardrobe supervisor with Ashleigh Haines (Taking It Out) and Kylie Daykin (Lucinda) leading the hair and make-up team. Maria Martin is on board as production designer and graphic design is being carried out by Poppaea Bicknell (art director, Dancer). James Webber is the film's second unit director. ‘The Callback Queen’ film is due to be completed at the end of this year.